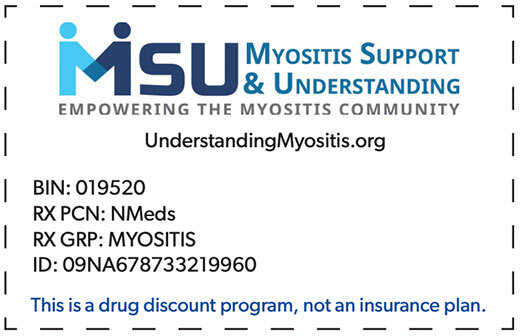 On August 1, 2018, as part of its continuing effort to empower the myositis community, Myositis Support and Understanding Association, Inc. (MSU) has entered into a partnership with NeedyMeds to provide members with access to prescription discounts through the NeedyMeds Drug Discount Card. A part of the determination to partner with is based on its status as a national non-profit and its like mission, “dedicated to educating and empowering those seeking affordable healthcare,” similar to that of MSU. Download your printable drug discount card or request a physical card by mail. Includes an information sheet and phone number for more detailed information about using the discount drug card. Prescription Assistance Programs (PAP) that provide the most savings for brand name prescription medications. Help may be available if you need help completing an application for a Prescription Assistance Program. The $4 Generic Discount Drug Program is a great resource for finding generic medications for a discounted price. In need of Affordable primary and preventive care? Search the free/low-cost or sliding scale database for convenient locations for medical, dental, mental health or substance addiction clinics. Search the Coupons & Rebates section and connect to discounted over-the-counter drugs, prescription medicines and medical supplies. Diagnosis-Based Assistance database. Here you can find programs that will help you afford medical needs such as medical equipment, respite care or living expenses while receiving treatment. Government Programs section is another important destination to search for Government Funded healthcare programs – and other helpful resources – in your state. There are times when we may need financial assistance for the prescription drugs we take to treat Myositis. We have included a list of some popular programs that may be able to help. Provides eligible underinsured individuals with financial assistance to cover all or part of the individuals’ out-of-pocket cost for supported medications. These programs give individuals the ability to afford their medications. Rx Outreach is a fully-licensed nonprofit mail-order pharmacy. MSU members have reported to us that this is a great resource for lower cost medications.